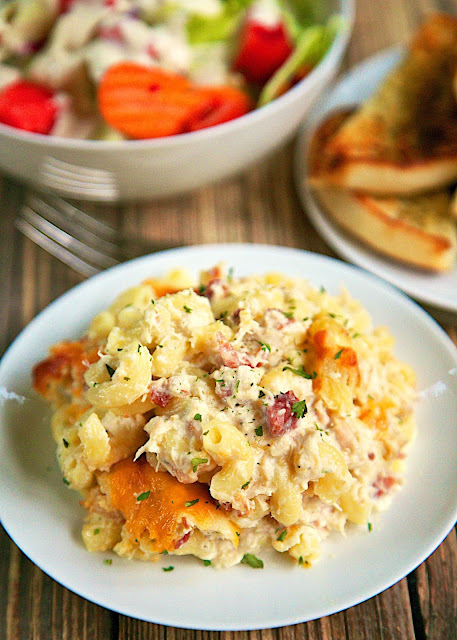 Cracked Out Three Cheese Chicken Alfredo Bake Recipe - chicken, cheddar, bacon, ranch, alfredo sauce, pasta, mozzarella - makes a ton! Great for a potluck. We like to freeze half of it unbaked for later. Great reheated too! Once of our favorite weeknight casseroles! 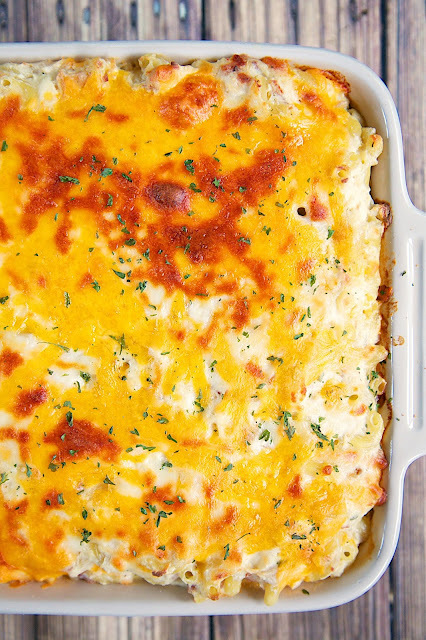 This recipe is adapted from one of our all-time favorite recipes, Three Cheese Chicken Alfredo Bake. 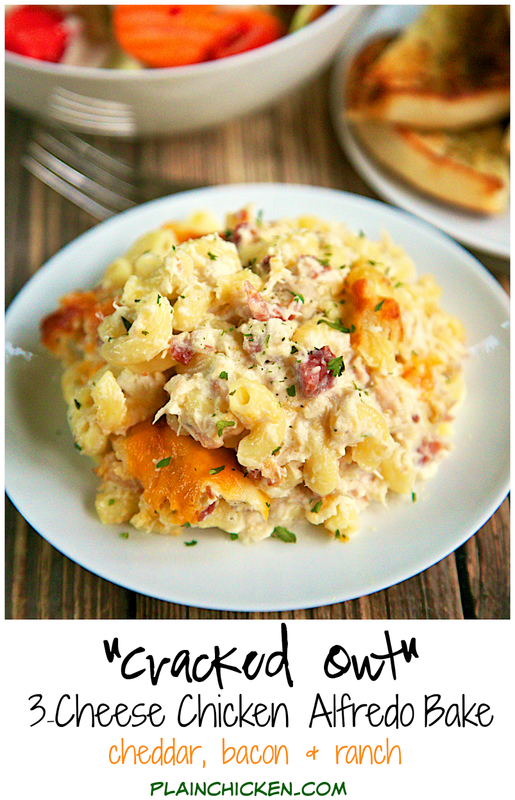 We love to "Crack Out" our favorite recipes; adding cheddar, bacon and ranch. This turned out SO good! We ate this for dinner and lunch the next day. YUM!!! This makes a ton. I usually half the recipe for us and we still have plenty of leftovers. This also freezes well. I love to make this for potlucks since it serves so many people and is easy to make. My secret to having this casserole ready in minutes is using a whole rotisserie chicken. I mix everything together while the pasta is cooking. Once the pasta is done, toss it in the chicken alfredo mixture and it is ready to bake. So quick and easy. We serve this with a simple salad and a little garlic bread. It is one of our favorite meals! Preheat oven to 350ºF. Lightly spray 9x13-inch pan with cooking spray. Prepare pasta according to package directions; drain and return to pot. Stir together all ingredients and half of the mozzarella and cheddar cheese. Spread mixture into a lightly greased 13- x 9-inch baking dish. Sprinkle evenly with remaining half of mozzarella and cheddar cheese. I could go for a big serving of that right now and it's only 6:50am here. Looks sooooo yummy! Could I sub jarred alfredo sauce as long as the ounces add up? I'm a huge fan & I love your site/recipes....Thanks! I think that should be fine. Enjoy!! Where do you find refrigerated Alfredo sauce? I've looked and can't seem to find it. Have you ever made this ahead of time and kept refrigerated until ready to bake? Yes - it can be refrigerated and baked a day or two later. Can you make this ahead of time and keep refrigerated until ready to bake? Absolutely! I think you could make it and refrigerate it for a couple of days. Made this for a small group at church...HUGE hit. I didn't read the directions closely enough and I mixed everything together in a large saucepan on medium heat while the pasta was cooking. Then I mixed it all together in the pasta pot and poured it into my casserole dish to bake. Wonderful and easy to throw together. 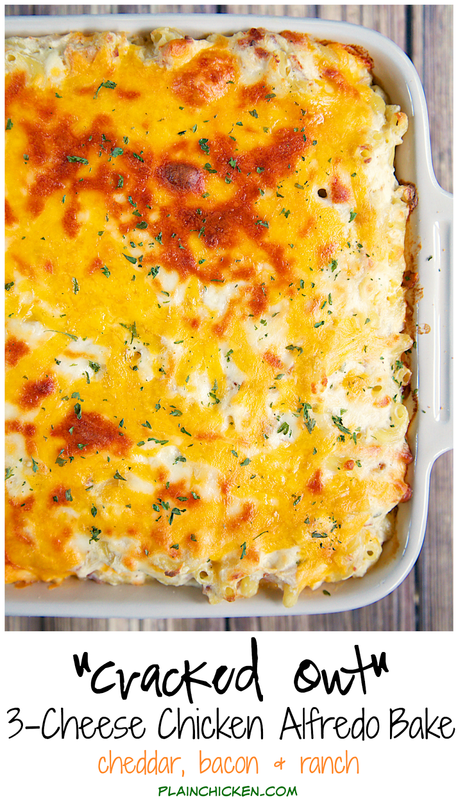 This is a very simple and quick casserole to put together. Perfect meal for a busy day. I almost always have cooked chopped chicken on hand in my freezer for casseroles like this one. If I don't, I usually grab the frozen fully cooked chicken strips in the freezer section of the grocery store and thaw it out, then chop them up. It was delicious and the kids just gobbled it up. Served it with a salad. If you were to freeze it, would you freeze it before or after baking (and cooling) it? Thanks!